Photo by Jamie Bartosch/Suburban TravelingMom Stopping for gas station snacks is a fun part for our family road trips. 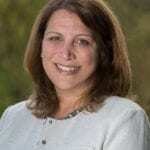 Driving on a long, boring stretch of highway with the family? How about a sinfully tasty family road trip snacks detour? Nothing perks up the family like a sugar stop at one of those giant, awesome, off-the-exit convenience stores/gas stations. There are some impressive ones along the U.S. highways, where you can fill up on gas, junk food, souvenirs and local specialties. Stopping for “gas station snacks” is a fun part for our family road trips. 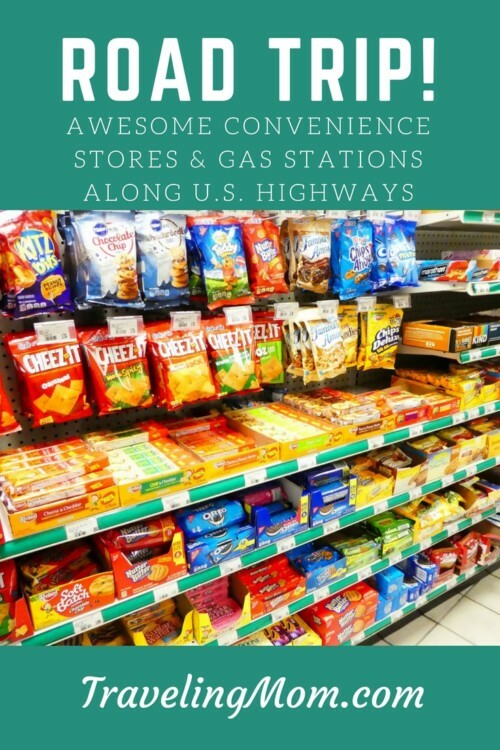 Gas station snacks are found at the mega convenient stores/gas stations along the highways. They’re like 7-11s on steroids. Like snack malls. 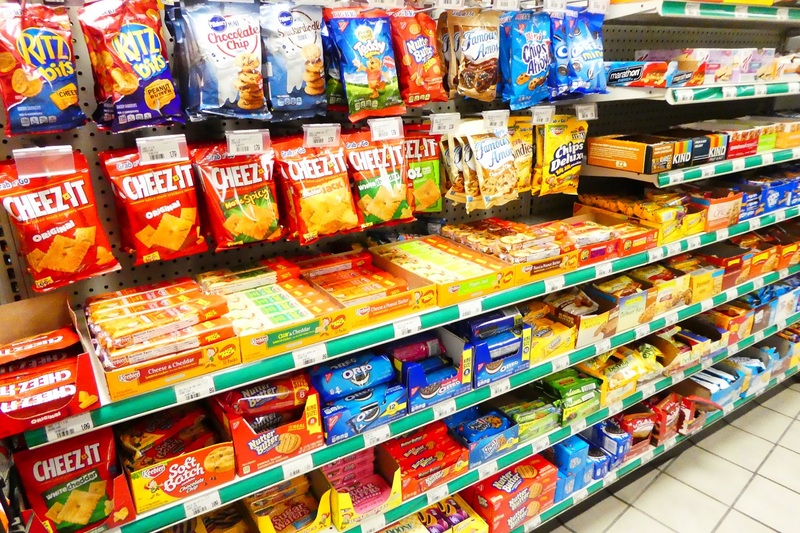 They have aisles filled with snack-sized portions of every variety of chips, candy, cold drink and ice cream you can imagine, plus some local specialties. “Oh, look at these!” one of us will inevitably shout, as we discover foods we’ve never seen before – stuff we can’t buy at our local grocery or Target stores. 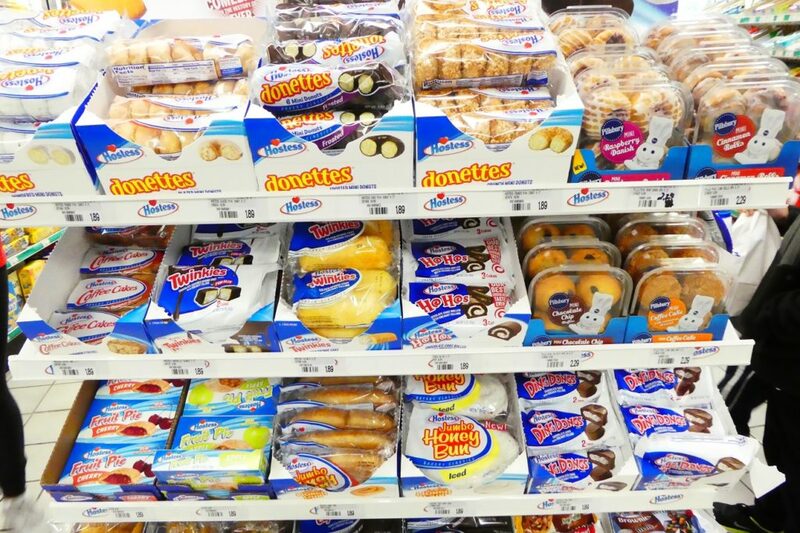 We’re talking half an aisle dedicated to every type of Hostess product. Frozen Ding Dongs or those hard-to-find chocolate-filled individual pies. Cheese puffs made by Nathan’s (the New York hot dog company). Strawberry Watermelon Hubba Bubba gum. Or a package of fresh cheese curds with those little, smoked sausage sticks in it. Even though I strictly enforce a 2-item max, I’m always about $20 lighter when we leave (before you judge, note that there are four of us.) Maybe it’s just fun to have a free pass to eat things we wouldn’t normally eat at home. Stopping for gas station snacks is a fun part of our family road trips. While most of these places are just gas stations with large convenience stores attached, some are famous landmarks. These stops can totally be tourist traps, but they’re still fun places to shop and stretch your legs while you wait for everyone to use the bathroom. For those who have driven I-80 through Illinois and Iowa, I don’t have to tell you that this is not a scenic drive. So The World’s Largest Truck Stop stands out like Oz. It’s massive, with more services than a mall. It’s an oasis for family road trip snacks. In addition to eight restaurants, the truck strip includes an impressive toy store, a dog wash, a chiropractor, a TV room, a gym, a library, a laundromat, private showers, and more. Interstate-90 is lined with Wall Drug signs for hundreds of miles. Coffee 5 cents! Wall Drug. 201 miles till Wall Drug. By the time you arrive at South Dakota’s western edge, you have to stop there. There’s a drug store, but also a restaurant, bakery, ice cream shop, tons of shopping (they have lots of cute cowboy boots and clothes), plus stuff for kids to climb and play on. And burn off that sugar overload from family road trip snacks… See more about Wall Drug in my story on a multi-generational trip to South Dakota. Wisconsin is known for its cheese. 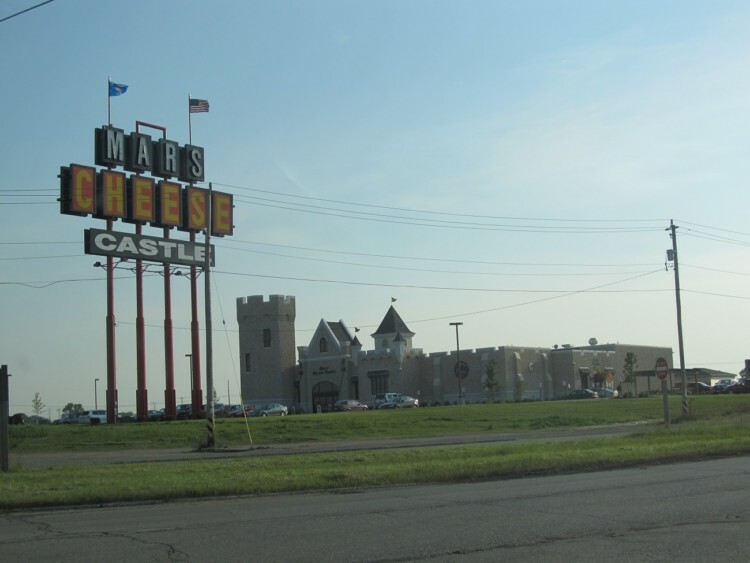 Mars Cheese Castle is a landmark to anyone who drives between Chicago and Milwaukee. The castle was recently expanded and modernized. Now it offers a bakery, restaurant, gift shop, and more cheese than ever, including an entire refrigerated wall loaded with different types of cheese curds. They also sell the popular only-sold-in-Wisconsin New Glarus beer and corny cheese-themed souvenirs. Don’t leave without taking a photo with their mouse statue. Mars Cheese Castle is a fun family road trip snacks stop on I-94 in Wisconsin. Tiger Truck Stop, on I-10 in Grosse Tete, Louisiana, outside of Baton Rouge, has caged Bengal tiger named Tony that you can visit. They also sell T-shirts that say “Animal Rights Activists Taste Like Chicken.” In other words, Tony the Truck Stop Tiger is a controversial attraction. But certainly something you don’t see at any other truck stop. Trails Travel Center, where I-35 and I-90 meet, in Albert Lea, Minnesota, south of Minneapolis, has a laundromat, a movie theater, and a chapel service lead by Truck Stop Ministries at 10 a.m. every Sunday. Johnson’s Corner, on I-25 in Johnstown, Colorado, south of Loveland, was named “The Best Truck Stop Restaurant in the U.S.” in 2004 by the Food Network, because of its famous, homemade cinnamon rolls. Any other must-stop family road trip snacks detours our readers should know about?